Discussion in 'Nike Retro' started by nawghtyhare, Oct 26, 2009. I posted pics of them when I first got them. It’s lying when calling a spade a spade? they werent tagged nor on feet. anyways, didnt u say u still had them sitting collecting dust anyway? What about the lebron 16 king joints you had ??? You posted a on foot pic to flex in the lbj 16 thread and a few weeks later you returned it back. Ill call a spade a spade too. Got rid of them. Beautiful shoe but I realized I wouldn’t wear them. Sent them back where they came from, and copped Chicago 1s . I returned those. Lol so? We all return stuff we second guess. Glad I did... wouldn’t haven’t worn them. HKs are the most overrated AF1 of all time. It is not attractive. Worrying about how shoes are "rated" is your first problem. nawghtyhare, JPS, Gordonson and 4 others like this. I often times wonder how/why some come to these conclusions...If you don't like something, how is it overrated to you? nawghtyhare and Gordonson like this. Its almost as if people can have different opinions. Taiwans do nothing for me but a lot of people love them so maybe I'm the weird one. There's lot of shoes that others love that dont do it for me. I don't consider them "overrated", they just arent for me. The day I like every shoe that everyone else likes is the day I know I've become a hypebeast. JPS and sylvestermcgrizzly like this. I've been a hypebeast for ten years. It's fine. Kim Fatty the Third, nawghtyhare, JPS and 2 others like this. I don't consider them "overrated", they just arent for me. That's the way it should always be. I know i own a ton of kicks, clothes, and other merchandise most wouldn't like and vice versa. I always used NT as a tool to get more information and better pics for things that interested me that i may be on the fence for, not for confirmation from others that a release is "dope" or not. We all see things differently. I just often times see those terms passed around as if someone's objective opinion is more valuable than others. johngotty and dblplay1212 like this. (not my pic) But I've gotten a ton of compliments from my pair. Also saw a random pair at Wrenthem, MA outlet this weekend. They were like $80ish I think. D Double, ktang235, egaroc1 and 4 others like this. anyone remember those and have pics? what?? I’m referring to looks. They are overrated in looks. Why else would someone like an AF1? We like how they look. By saying they're overrated, I take that to mean you feel that other people like them a lot for no reason. It's absurd to me that you even take what other people think about a shoe and use that as a defining characteristic for something. If I like how a shoe looks, I like it. If I don't, I don't. Never concerned about how anyone rates it. I think you’re taking what I said and blowing it out of proportion because you don’t like my choice of the word “overrated.” You’re nitpicking, instead of speaking to why you like the shoe. We here to discuss the shoes. Don’t take what I say and twist it. the 718 truth, Air Money, ahat20 and 2 others like this. 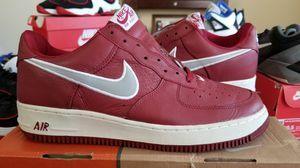 Do the HK retros fit like most other AF1 lows? Should I go TTS or down 0.5? Air Money, crumps brother, Gordonson and 2 others like this. How did you get not black from a picture of jeans and air forces? My skin isn’t even showing.